Whenever I think of Sri Lankan food the first thing that comes to my mind is pol sambol – a coconut relish made with freshly grated coconut, dried red chillies, red onions, salt, lime juice and umbalakada (also known as Maldive fish) which is cured fish traditionally produced in the Maldives and commonly used in Sri Lankan dishes. 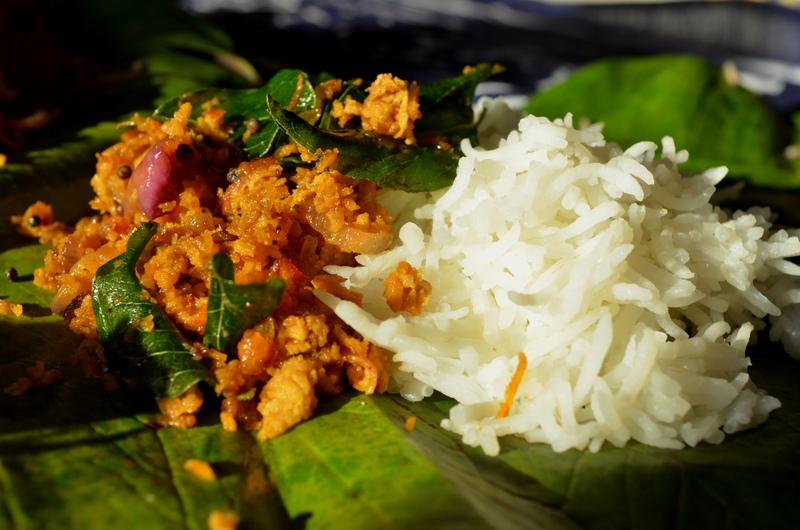 Pol sambol is served as an accompaniment to rice, iddi appa – string hoppers (stringy rice pancakes), appa – hoppers (a sort of rice flour pancake) roti and even plain bread and butter (look out for a post on Sri Lankan food later). It goes well with everything but I prefer to eat it with steaming hot rice. 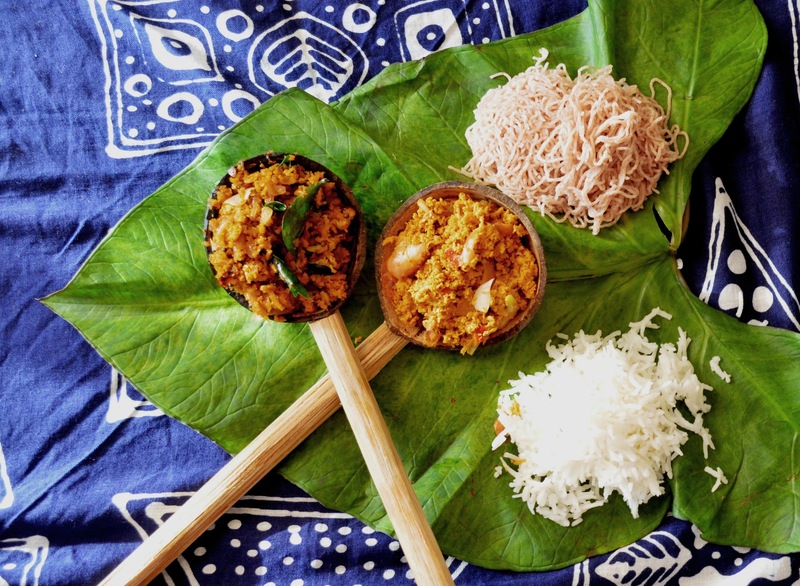 Sri Lankan cuisine is a lot similar to South Indian food, especially that of Kerala (I have had the wonderful opportunity to experience authentic Keralite dishes as my husband is from Kerala and his mom and sisters are brilliant cooks). 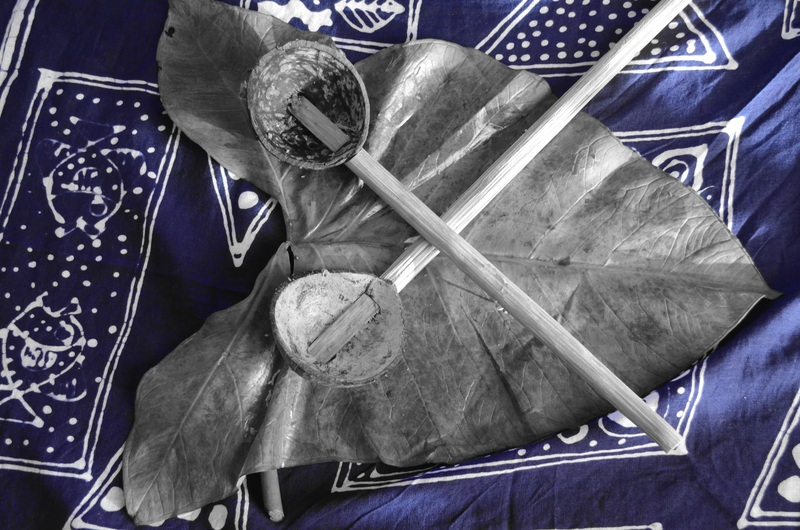 Our iddi appa is known to them as iddi appam, appa is appam, and pittu (a breakfast dish made out of rice flour and coconut) – puttu. We often argue over the origins of these dishes but the differences between the two cuisines are so fine that it is difficult to say who invented what. Fortunately no claims have yet been made on our humble pol sambol. 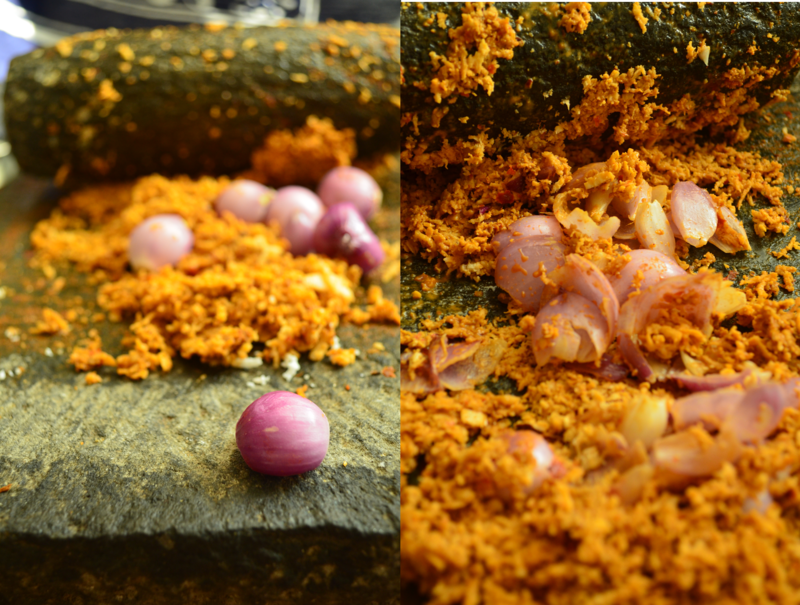 The authentic way of preparing a pol sambol is by grinding it on a rectangular block of granite with a granite rolling-pin of sorts which is known as a miris-gala in Sinhalese (literally translated to chilli-stone). 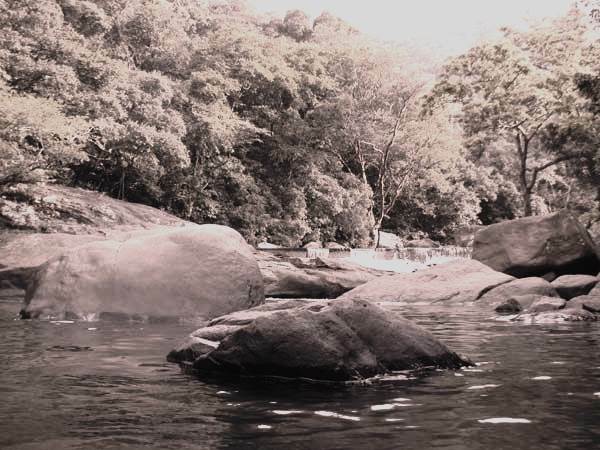 These grinding stones are used for grinding all sorts of pastes used in Sri Lankan curries. 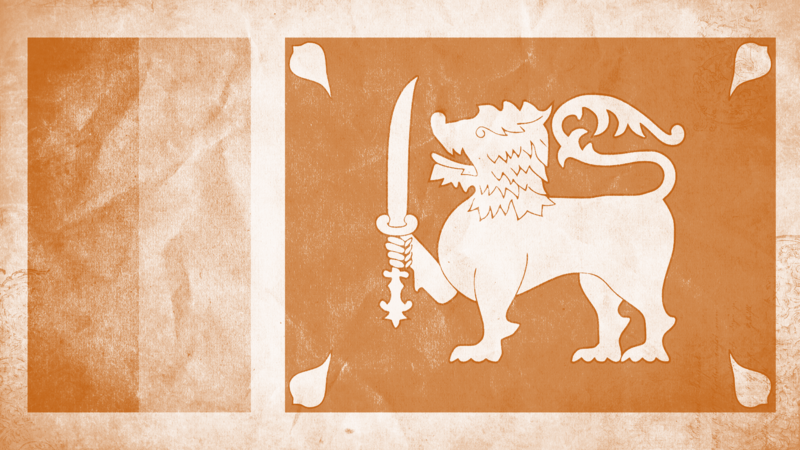 Not everyone living outside Sri Lanka owns a miris-gala and the one I have is a spare from my sister-in-law. A good old stone mortar and pestle works just fine. Pol sambol is best prepared with fresh ingredients but I have given substitutes in the recipe as some of the ingredients can be difficult to get hold of. First, throw in the dried red chillies and salt on to the grinding-stone (or into the mortar and pestle) and grind into a fine paste – this requires a lot of elbow grease but don’t be disheartened because the paste is the backbone of the entire dish, you need to get it right. If the mixture gets too dry and difficult to grind add a teaspoon of water (no more than a teaspoon otherwise it will be too wet). You know it’s ready when there are no chilli seeds visible in the paste. 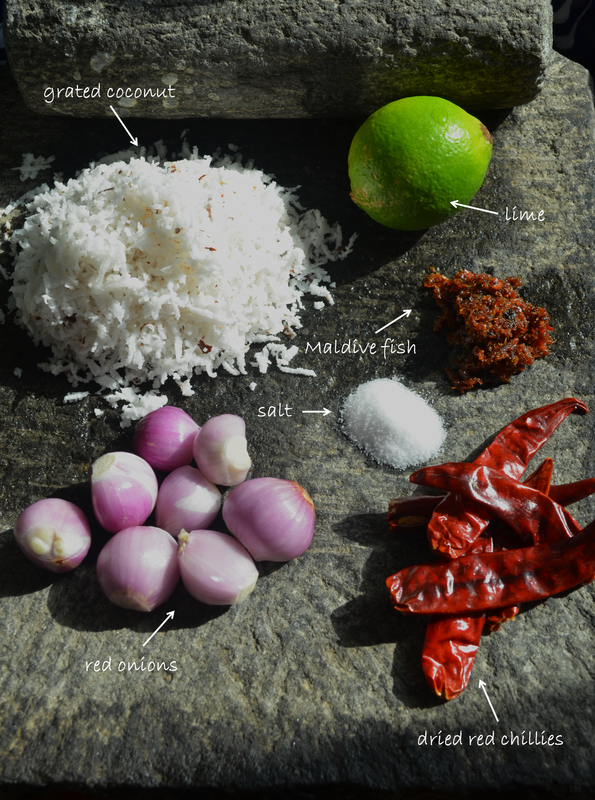 Add the Maldive fish flakes (if using) and give it a little grind – don’t overdo it, you want to have little flecks of fish in the sambol to give it texture. Next, add the coconut and combine with the paste. 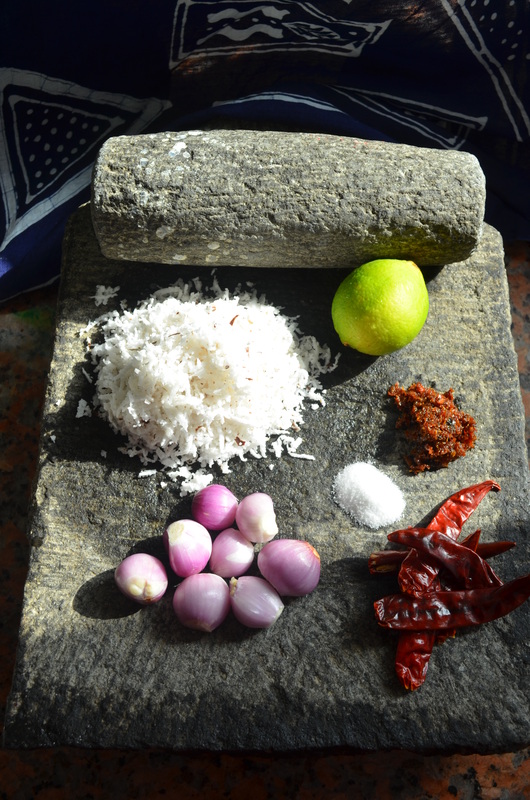 Use the pestle to push the paste into the coconut so it absorbs the flavour and colour of the chilli paste. Throw in the red onions. Give these little rubies a good bash with the pestle and mix it with the coconut. Do not grind the onion too finely; we are looking for little chunks, not a slimy mush. That’s your basic pol sambol, done. You can make a variation of this by sautéing the pol sambol in mustard seeds, curry leaves and sliced onion (it’s called badapu (sautéed) pol sambol and I absolutely love it!). If you are tempted to try both, divide the coconut mixture into two parts. To finish off the basic version, add a generous squeeze of lime juice and give it a good mix (best done using your bare hands. 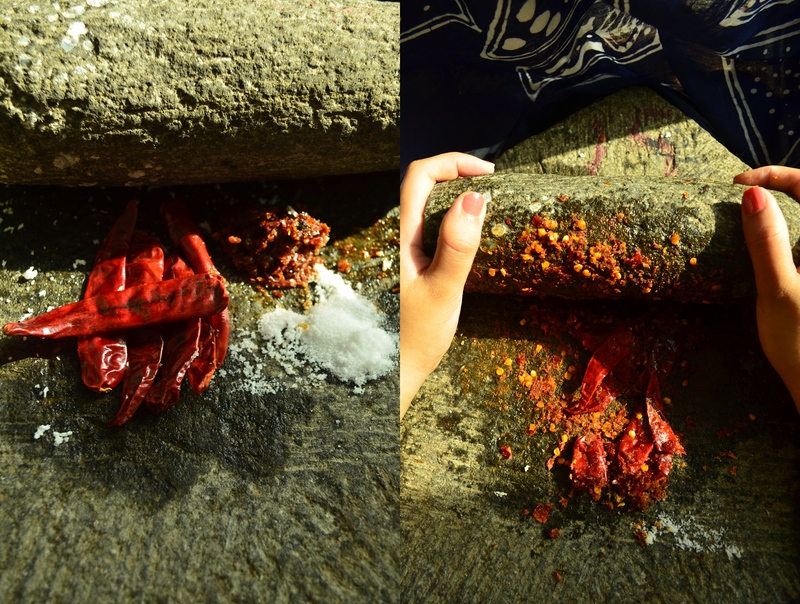 It may seem a bit repulsive but somehow the flavour intensifies when mixed with your fingers). Now for the tempered version. Get a nice frying pan (the one I have used is another typical South Asian cooking utensil used for making hoppers and doubles as a frying pan). Heat some oil on high heat. When the oil is nice and hot throw in the mustard seeds and when they start to splutter add the curry leaves and sliced onions. 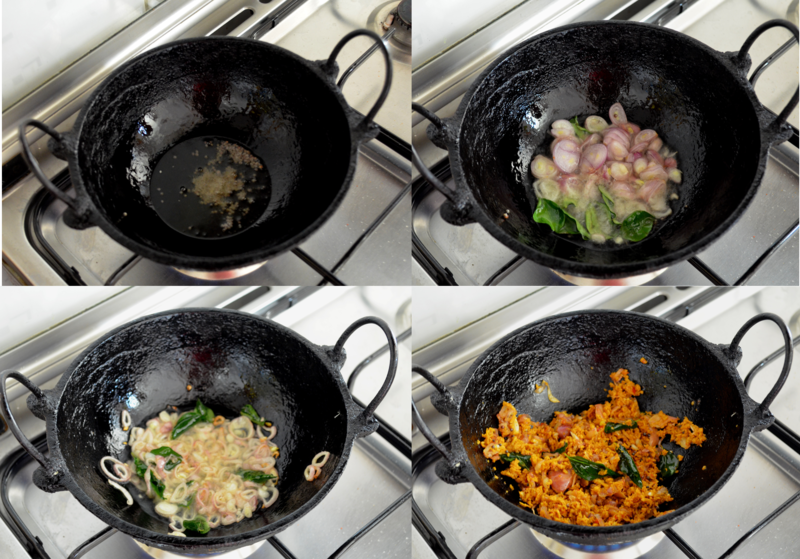 Sauté well till the onion turns brown and add the pol sambol (the one without the lime juice). Give it a good mix and let the mixture dry out a bit before taking it off the fire. 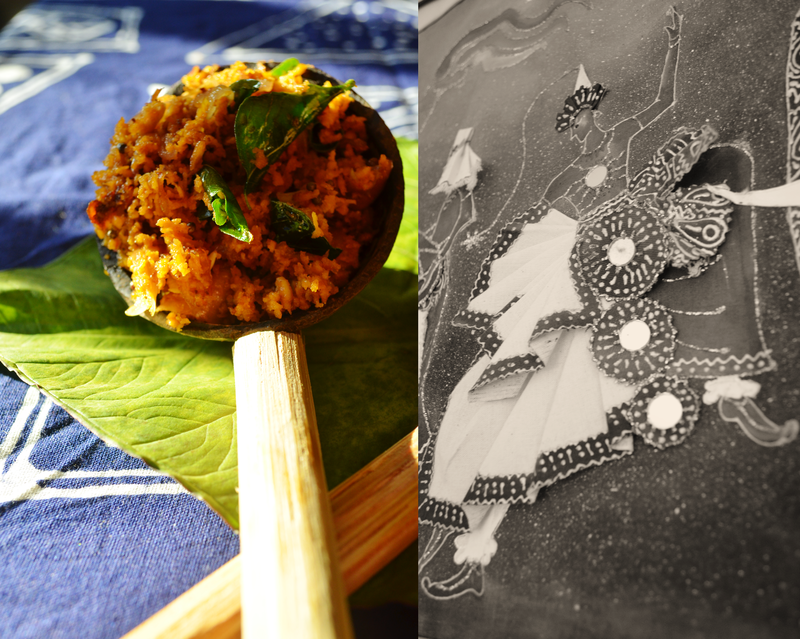 The perfect Sri Lankan pol sambol – two ways! (substitute – desiccated coconut. Before using, sprinkle some water over the coconut and microwave for a minute to moisten the coconut). Throw in the whole chillies (or chilli flakes and chili powder) and salt into a mortar and pestle and grind till it turns into a fine paste (there should be no visible chilli seeds). Next, add the Maldive fish and mix in with the paste. Add the onions. Using the pestle crush the onions and combine with the chilli paste. Finally add the grated coconut and give it a good mix with the pestle till the paste is completely mixed in with the coconut. 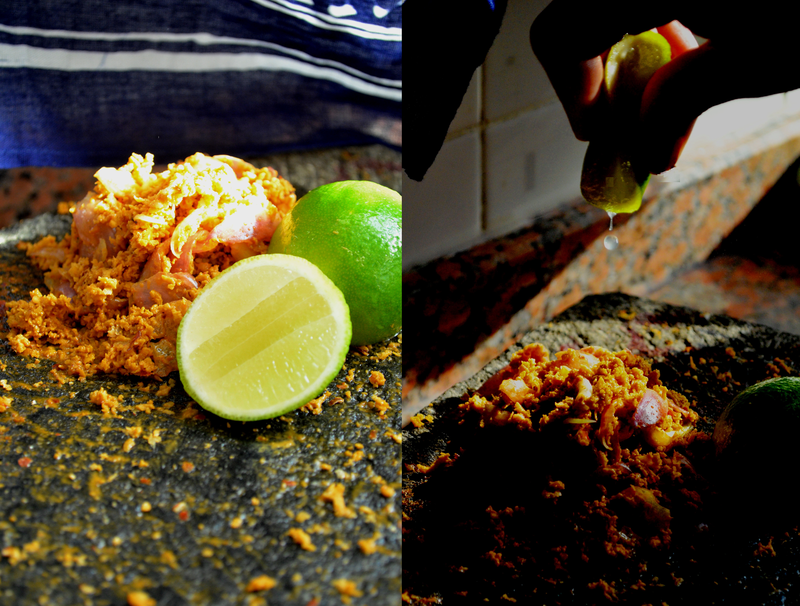 For the basic pol sambol, add a generous squeeze of lime and mix well, ideally using your hands – yes! Using a squeaky clean hand, mix the sambol using gentle pressure for about 15 seconds, this intensifies the flavour of the sambol. Serve immediately with rice, string hoppers, hoppers, roti, bread and butter or just about anything you fancy. Do not add lime juice to the final coconut mixture. 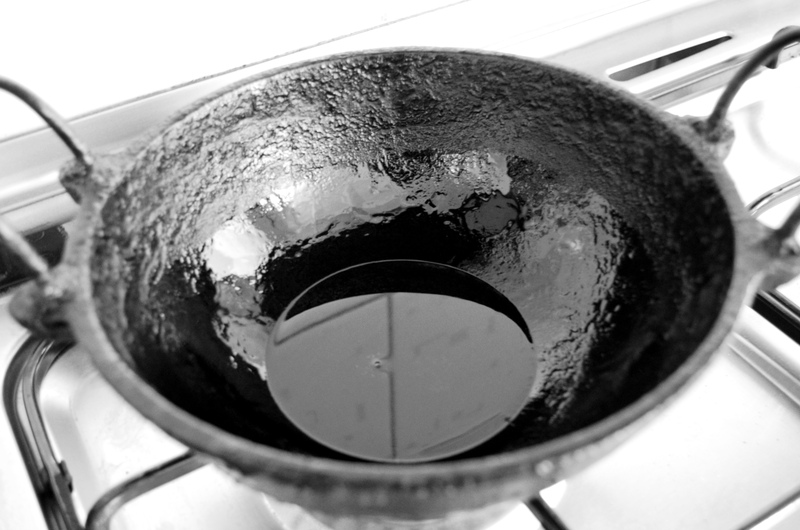 Heat around 1 tbsp of oil in a frying pan until very hot. Throw in 1 tsp of mustard seeds. 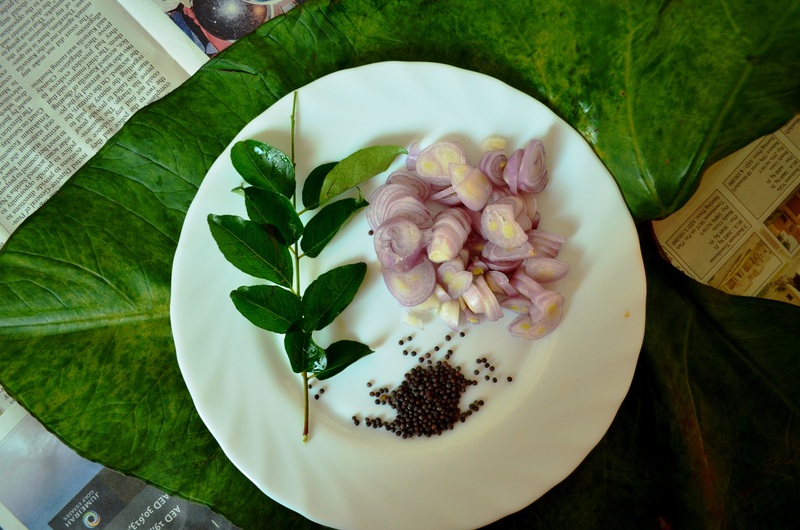 When they start to pop and splutter, add around 2 tbsp of finely sliced red onion and 5-6 curry leaves. Sauté until onions turn golden brown. Add the coconut mixture and give it a good mix. Sauté the sambol until the coconut turns slightly dry (around 2-3 minutes). Serve immediately or let it cool down completely and store in an airtight container in the refrigerator (keeps well for 2-3 weeks). 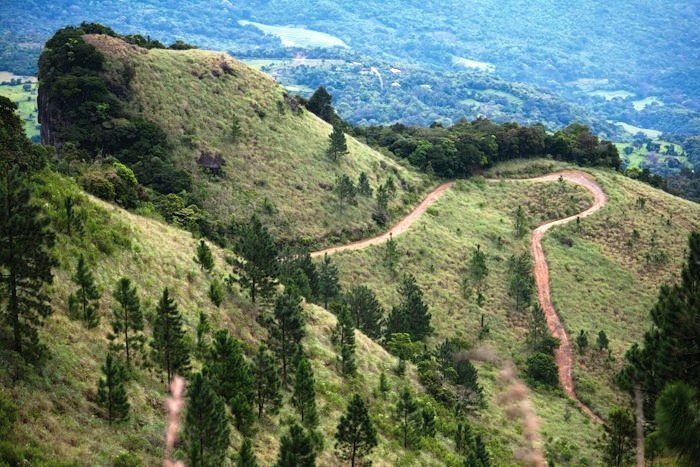 This entry was posted in Sides, Sri Lankan cuisine and tagged Chili pepper, Coconut sambol, Pol Sambol, Sri Lankan cuisine. Bookmark the permalink.